Sylvia played by Tonto Dikeh and her friend come into contact with Collins played by Seun Akindele when they knock him over in the road on a dark night. Sylvia is driving erratically as they are escaping from a hotel room where she had seduced her friends father in order to steal documents on behalf of her friend. She is expressing her disgust for her friend’s father and not paying attention to the road when the accident takes place. Desmond played by Yul Edochie and Lola played by Annie Macaulay are engaged to be married but their relationship is being put in jeopardy by a girl that Lola keeps meeting in his home who claims to have been dating him for years, however when Desmond is around she disappeared. Is she a ghost? I was excited when I saw this movie. Jenifer Eliogu is making a comeback, supported by a great cast. Ikechukwu Onyeka has done many movies that I’ve enjoyed The movie starts off with action we see Tonto Dikeh fleeing almost naked from a mans room after stealing some documents for her friend. It was a great way to start the movie as it is immediately engaging and makes you want to continue watching to find out why. We see Lola diss Desmond and run off with another guy but then the next day they are all lovey dovey again and there is no explanation of how it got to that from how we last saw them. Say what? In one scene Sylvia says to her mother, “Sorry to disappoint you mum you did not bring me up cos if you did BROUGHT me up I would have had a father” Huh? Say WHAT? That doesn’t even make sense. I wonder if “brought” was scripted or its just Tonto fukking up the words as she seems to be doing a lot lately. By the time I had got to the end of part 2 I wasn’t too impressed. Not to say the movie was the pits but to be honest I expected more. Too many things did not fit in with the movie. for instance we never go back to the opening scene to find out what all that was about. I hope it will all make more sense in the continuation, because as it was I just didn’t get the point of it. The movie already was only 50 minutes long in part one and then in part two they go over part 1 for a whole 10 minutes. Part 2 is 32 minutes and doesn’t end. I felt conned. It started off well but by the end I felt unsatisfied. I would recommend the movie only for the performances by the cast. Nollywood forever, have you had a chance to watch Quiet Storm, Amanda, I am King, Palace Crisis,Breaking the News, Good Girls Gone Bad? Nooooo I have not watched any of those you have mentioned although I watched the 3 and 4 to Good Girls gone bad without knowing that it was a continuation. I reviewed the movie here: PRETTY LIARS. I enjoyed it. I know what you mean. I'm kinda sorta waiting to found out exactly was it going on too. Let me buy this on Saturday, only bcos i luv Yul and Seun. I will then comment. Yes let us know what you think Jojo. 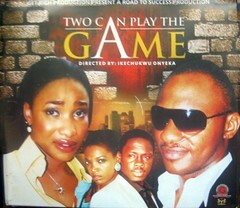 Ahhhh abeg where do you get these movies?Here in the USA, we dont get them that first LOL…. Its all a game of chance. The US get so many movies out first. So many you guys have seen even last year that have not yet touched these shores! Nolly have you seen Pool Party, Crazy, Hidden Pleasures, and Quiet Storm? Just recvd these in the mail gwaan watch dem this weekend. Ali Nuhu's Soup coolers bottom lips which is extra dry and extremely cracked up irritates me – and and top of that he is a very bad actor. Just pitiful. Wow! LOL I haven't been focusing on the lips. I had too much of Ali last year so I mostly take a step back nowadays. You can still be camp and married. He is rather effeminate I aint gonna lie. hallelujah………give Jesus a wiper somebody! at least i'm not the only one saying this. he's married? stop playing. as in for REAL? wow! well, you know the only reason he is, is because of the part of the country he happens to come from and we all know that if he tries anything sketchy, something really bad is going to happen to him. Hi nolly… When will u do a review on heart of a fighter, continuation, royal fighter and ladies men continuation, ladies gang? I have not seen any of them although I started watching Ladies Men last night. As soon as I have watched I will post. I have not seen Heart of a Fighter anywhere. Did you watch the continuation of this movie? Tonto's character had to go abroad for awhile (her friend published some scandalous pics in a mag and she could not stand the shame) and her mom meets her ex and falls for him (when Tonto comes back to the country….drama ensues). Also, Annie's character turns the table on Yul's character and they keep playing their stupid game on each other till they finally figure out themselves (and we get to see them get married). @GigiChiny Hey! I did not watch the continuation. I havent seen it anywhere. does it have the same name? I hope you don't mind. I am posting with my twitter account and I want to see if I am notified of a reply to m y post. @Gigi Chiny Hey thats fine! did the continuation have the same name?